I’ve bent over backwards lately second-guessing my permabear side, on a hair-trigger as I wait for the short squeeze from hell to begin. Instead, the Masters of the Universe who supposedly control the stock market like it’s a PlayStation game can barely muster a decent rally other than fleeting ones on the opening bar. Have I perhaps overestimated the sleaze-balls? Probably. Regardless, it all comes down to whether they can consistently push stocks above previous peaks on the hourly chart. This generates bullish ‘impulse legs’ that are the building blocks of a healthy bull market. Lately, the builders have been quite timid, to put it charitably. It’s hard to blame them, given the dispiriting drift of the news. Here are a half-dozen sobering headlines just from Tuesday: 1) Home Sales Posted Steep Fall in December; 2) World Braces for Slower Growth; 3) Silicon Valley’s Unbridled Optimism Gets Fresh Reality Check; 4) Stock Market’s Next Hurdle: Tech and Industrial Earnings; 5) UBS Warns Downturn Isn’t Over Yet After Clients Pull $13 Billion; and 6) Shutdown Could Hit Already-Lousy U.S. Home Sales. Sobering facts — indeed, sobriety itself — are the last thing Wall Street wants. The idea of carefully measured analysis is anathema to bull markets. Unfortunately for investors, this is exactly what has come to bear recently on erstwhile world-beaters like Facebook, Amazon and Apple. I seriously doubt that Apple will be able to recover to new all-time highs any time soon. 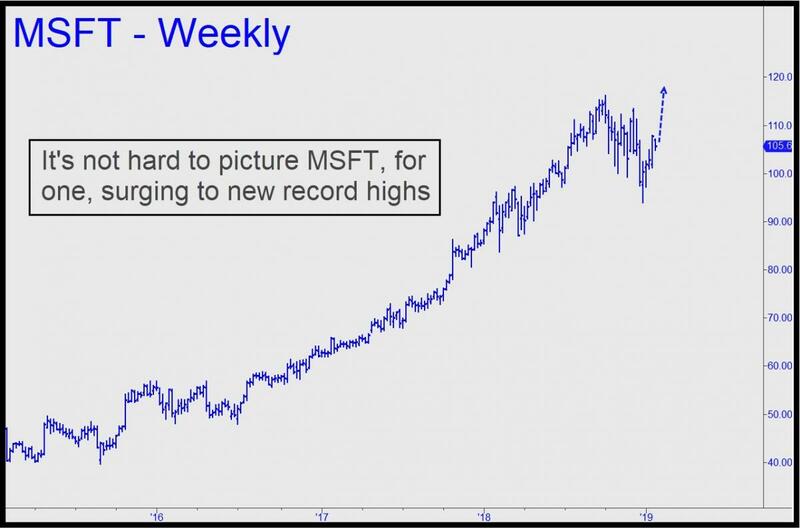 Even so, and regardless of the glum economic picture, the charts of the following stocks show each of them to be capable of rallying to new all-time highs in as little as three weeks: NFLX, NKE, TSLA, MSFT, GOOG, AMZN and BA. In fact, AAPL is the exception, with a chart so ugly that it looks like it could take months for the stock to base. (Facebook looks like hell, too, but also potentially feistier.) Could bulls conceivably romp once again without AAPL’s participation, and with the economies of Germany and China imploding? It’s tempting for me to tell you how unlikely and illogical this would be. But as we know, stranger things have happened.